ASUS GPU Tweak for Windows 7 - software for fine-tuning graphic adapters produced by a well-known company. Monitors the operation of the video card, providing the ability to change a number of parameters. Allows you to change the frequency of memory, processor, temperature, speed of rotation of coolers. It is possible to create user profiles. The original interface has a modern look, it is convenient to use. All information about the adapter, as well as tools for work, is clearly represented in the main window. There is a utility to automatically update drivers. 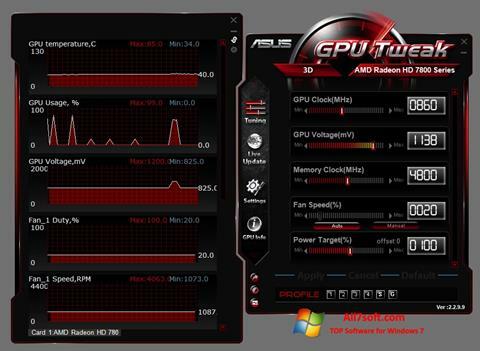 You can free download ASUS GPU Tweak official latest version for Windows 7 in English. Publisher Software: ASUSTeK Computer Inc.